To encourage technicians and assistants to reach their goals, the AAEVT has established a scholarship for those members who are enrolled in the AAEVT Online Certificate Program. 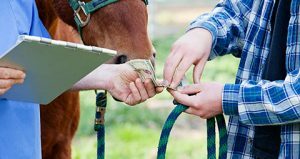 This scholarship was established to assist equine veterinary technicians, assistants and students in attending AAEVT continuing education courses, AAEVT meetings, equine related online courses, and/or assist with tuition costs involved in obtaining their veterinary technology degree. The AAEVT has established this annual scholarship for first time non-credentialed participants a chance to further their education and enhance their skills. This scholarship will cover registration to the AAEVT Annual Conference for the year applied (does not include wet labs). NOTE: The funds for these scholarships come from YOU and your peers! The generous donations received at Silent Auctions and Raffles that we hold at our CE events throughout the year, and from select Sponsors, provide the funds for us to offer these amazing Scholarships. Additional details and Application Forms may be found below. AAEVT member, Milissa Finnegan RVT, passed away suddenly in December 2008. She was enrolled in the AAEVT online Equine Certificate Program and she had just returned from her first AAEP Convention. Due to her untimely passing, Milissa was unable to complete the few remaining courses to fulfill her professional goal of earning this Certificate. It meant a great deal to her. To honor her commitment, the AAEVT presented Dr. Strickland, her employer and AAEP member, her Certificate of Completion which he presented to her family at her memorial. 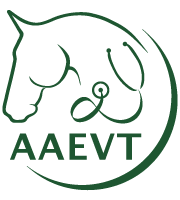 To encourage other technicians and assistants to reach their goals, and at the suggestion of her family and employer, the AAEVT has established a scholarship for those who are enrolled in the AAEVT Online Equine Certificate Program. Applicants must be current AAEVT members in good standing and at the time of application and currently enrolled in the AAEVT Online Equine Certification Program. Resume including previous and current employment, with dates, giving brief details of job titles and duties, including names of organization, association or practice address. Short essay describing why this scholarship is important to you in furthering your educational career, what your career goals are, and why horses have made an impact on your life. Overview of what stage you are in the AAEVT Online Equine Certificate Program, including enrollment date, list of completed courses, which Regional meeting you plan to attend, and (if applicable) what benefits the online program has provided. Letter of recommendation (minimum of one) from an active member of the AAEVT or AAEP, stating why they feel you will benefit from this scholarship. In August 2006, at the conclusion of the AAEVT Regional Symposium in Lexington, KY, the AAEVT and the Veterinary Technician community lost a treasured friend and colleague, Anne Bailey, LVT. Anne was one of the passengers aboard the Comair Flight that went down after take-off at Lexington Bluegrass airport. She was returning home to Canada where she worked for Dr. Ed Wiebe and Associates in Vancouver. Anne is survived by her husband, Mike Simrad, who has also initiated a charitable organization in Anne’s honor. The AAEVT established this scholarship in 2006 to honor her and her dedication to continue her education and enhance her skills. The intent of the scholarship is to assist equine veterinary technicians, assistants and students in attending AAEVT continuing education courses, AAEVT meetings, equine related online courses, and or with tuition costs involved in obtaining their veterinary technology education. The scholarships must be applied to costs associated with registration fees, texts, other fees or costs of an educational nature and any associated traveling or subsistence expenses. Applicants must be current AAEVT members in good standing and at the time of application and award. Applicants must be employed by a licensed veterinarian engaged in the practice of Equine Veterinary Medicine or enrolled in an Accredited AVMA/ CVMA Veterinary Technology Program in the United States or Canada with an Equine focus. List of extracurricular activities, other than employment, relative to veterinary technology and nursing. Brief statement of purpose for applying and indicate the precise use of the funds and how it may benefit you. Detailed description of educational program enrolled in noting courses of study or seminars. Include all dates of anticipated completion and CE or College credit hours that shall be included. CE course description: If you are planning to attend a continuing education course, describe the course (part-time, full time, modular, residential etc), the venue/location, date, name of the course organizer and itemization of all course fees, travel and subsistence costs that you will incur. Letter of recommendation (minimum of one) from an active member of the AAEP, another veterinarian in good standing or a professor who is a veterinarian, stating why they feel you will benefit from this scholarship. Dr. Midge Leitch had been a supporter and an educational partner of the AAEVT since the organization’s partnership with the AAEP in 2004. She was one of the co-authors of the AAEVT’s Nursing Manual and was always interested in furthering a technicians/assistants education. She was a proud member of the AAEP and believed that attendance of the AAEP’s Annual Meeting was crucial in honing skills and collaborating with fellow colleagues. The AAEVT has established this annual scholarship to honor her commitment to our organization and to offer first time non-credentialed participants a chance to further their education and enhance their skills. The scholarship will cover registration to the AAEVT Annual Conference for the year applied in (does not include wet labs). Applicants must be first time non-credentialed attendees of the AAEP Conference, and must be an AAEVT member in good standing. Short essay describing why this scholarship is important to you and what your future aspirations are as an equine veterinary assistant.